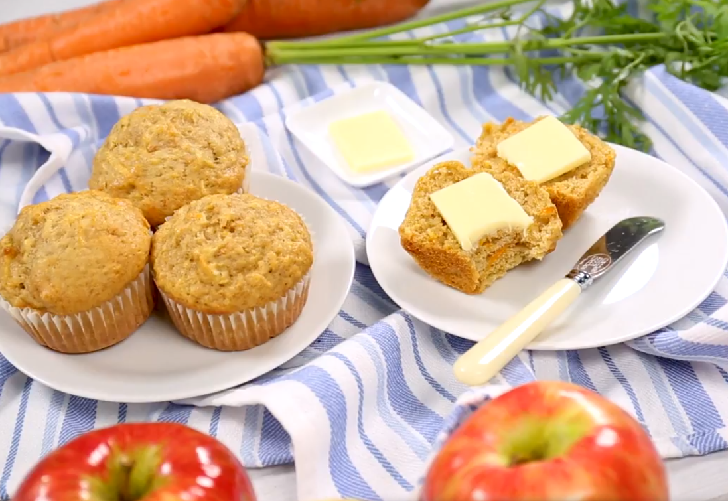 Carrot Apple Muffins are a healthy breakfast because it includes fresh vegetable, fruit, and eggs. You can make these muffins even healthier by replacing the all-purpose flour with whole wheat flour or oats flour. They’re soft and full of delicious flavor. They’re one of my favorite muffin recipes. ⏩Prepare eggs in a large mixing bowl and preheat oven to 375°F (190°C). ⏩Prepare muffin tin with liners or lightly grease them. ⏩To flax eggs mashed banana, maple syrup, olive oil and whisk to combine. ⏩Next add applesauce, brown sugar, baking soda, salt, cinnamon, and whisk to combine. ⏩Add almond milk and stir. ⏩Add grated carrot and stir. ⏩Add oats, almond meal, flour blend, and stir. ⏩Divide evenly among 12 muffin tins, filling them all the way up to the top, and top with crushed walnuts (optional). ⏩Bake for 32-36 minutes, or until deep golden brown and a toothpick inserted into the center comes out clean. When you press on the top it shouldn’t feel too spongy, so don’t be afraid of over baking! ⏩Remove from oven and let set in the pan for 15 minutes. Then flip on their sides still in the pan to let cool completely. ⏩If you try to unwrap them too quickly, they have a tendency to stick to the wrappers. ⏩Once cooled, store in a covered container or bag at room temp to keep fresh. Freeze after that to keep fresh.